Several hours after leaving Chamba, the bus found itself gingerly moving along the river Chandrabhaga. Rahul Sankrityayan, in his seminal work From Volga to Ganga, has described Chandrabhaga as the river of the lovers. One of his stories featured a star crossed woman who apparently went skinny dipping in this river. Such amorous hotness from classical antiquity generally keep me engaged, but on theses treacherous roads, the ageing and tired bus didn’t allow me that luxury. We had boarded the bus to go to Bairagarh at the Chamba bus station on that cold November morning after a superhuman effort to wake up and crawl out of the blanket. 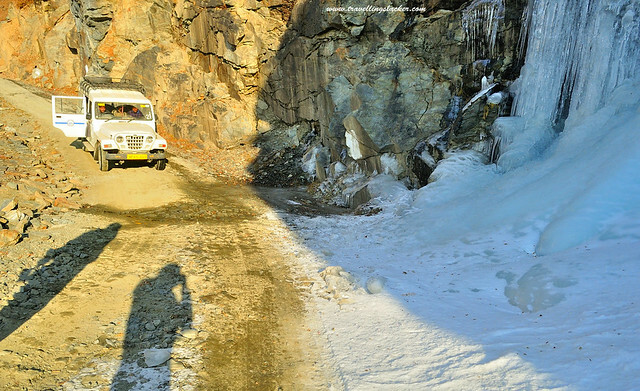 The distance did not seem too much at first, but the bus kept slowing itself down as the road got steeper and narrower. 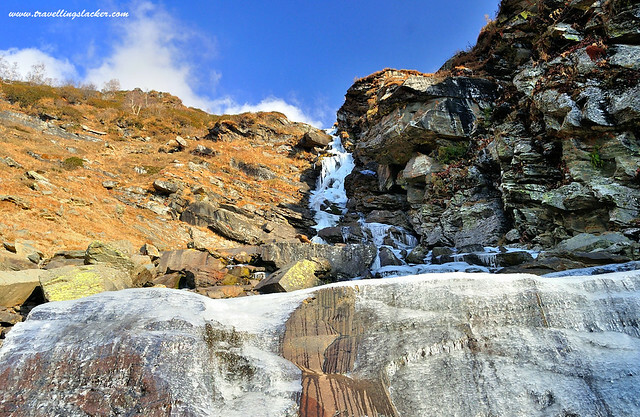 For some time it flirted with the Chandrabhaga but after sometime she got lost somewhere behind the ancient mountains. The music of her flow was still audible but she was out of sight, hidden amidst the steep gorges. In fact, there was no concrete plan at all. All we wanted to was to visit some obscure location to boast off. 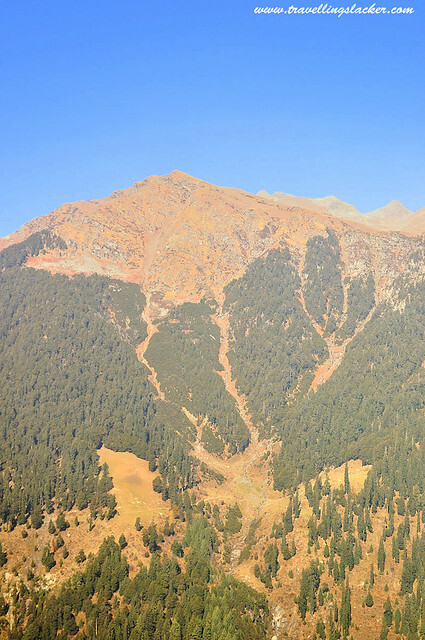 At 14500 feets or around 4400 metres, the Sach Pass or Sach Jot is higher than the more famous and tourist savvy cousin Rohtang Pass in Himachal Pradesh. 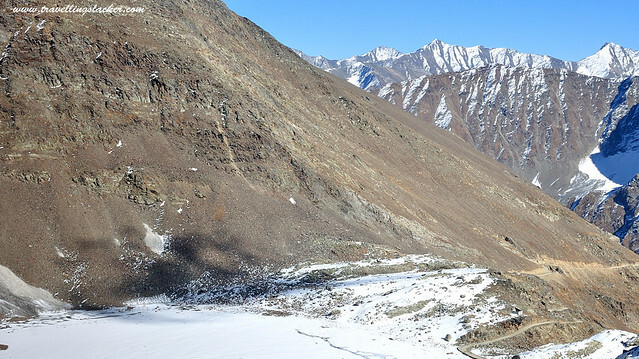 The pass leads to the Pangi Valley, a scarcely populated and somewhat isolated region which is not even a popular feature in the tourist map. We did not find much detail online about these places and in fact were unsure of the entire route. But we’d decided to take the plunge anyways. First we reached Bairagarh, the last permanent settlement before the pass. We had no idea about this place either till we noticed the name on the distance charts at the Chamba bus station. 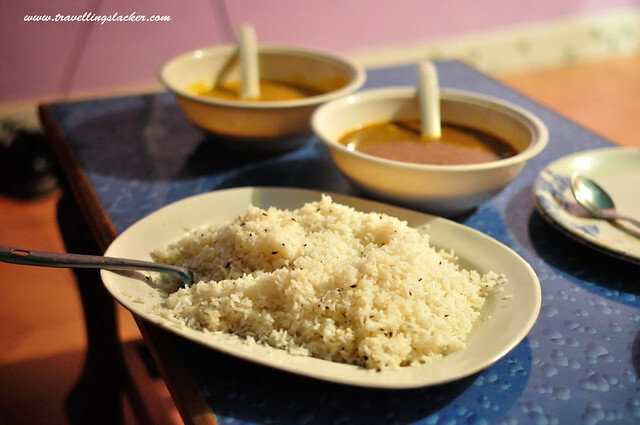 Another nearby place mentioned boldly on the charts was called Shatrundi. But nobody seemed to be going there. So, after talking to a few local people we decided to take a risk and move towards Bairagarh. Initially I was ruing the lack of frequent public transportation in the area but after that ride, I felt grateful that a transport system exists there after all. It looked like a sleepy village and we were wondering if anybody will provide accommodation out there, not to mention the provision for a further ride up the pass. However, a local guy, who claimed to provide good chicken and liquor among other things, took us to a local farmer who runs a homestay. Those comfortable beds and homemade food were far better than what we ever expected in that seemingly godforsaken location. The guy called himself Prabhdayal. While he had sharp Kashimiri facial features, he claimed to be a local. Our driver for the next day was also staying there for the night and he offered to take us to the pass and drop us back at Chamba the next day. So, we spent the evening roaming around the place and clicking random photographs. We started early in the morning. After a slow and tedious climb of around 20 minutes, the car broke down. The driver informed us that it will take at least half an hour to sort out the issues. So, we stepped out and started surveying the location. 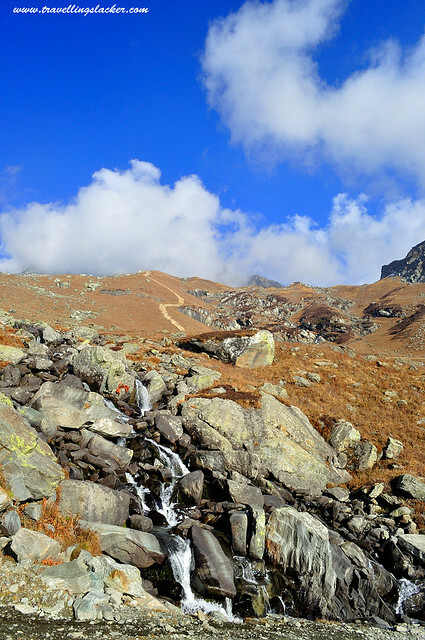 We were still below the tree line but the serpentine trail leading up to the top of the pass was visible clearly. The late autumn sun was pleasant but inadequate. At that altitude, even the cool shades of the coniferous trees have a piercing impact, especially if you forget to take your gloves. 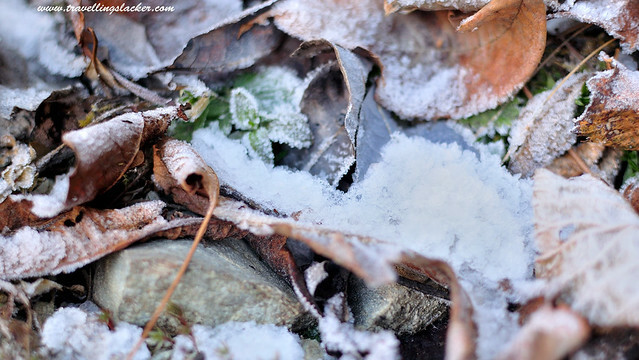 The first signs of the winter were visible as the road was covered with a thin layer of snow. I struck up a conversation with a local man who had taken a lift in our car. What I learnt from him was far from encouraging. 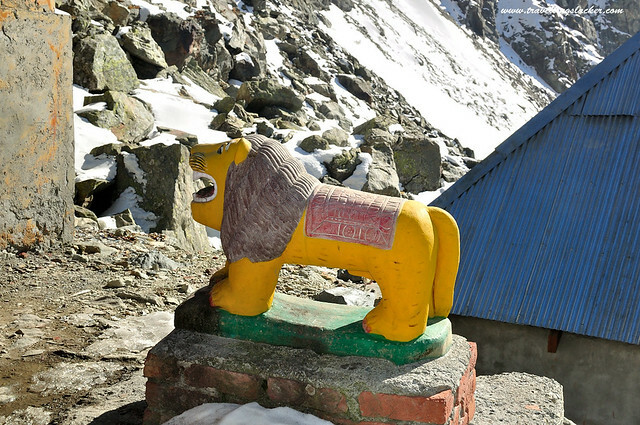 We already knew that we were a bit too late to venture into Pangi and that is why were only planning to climb up the pass and come back. 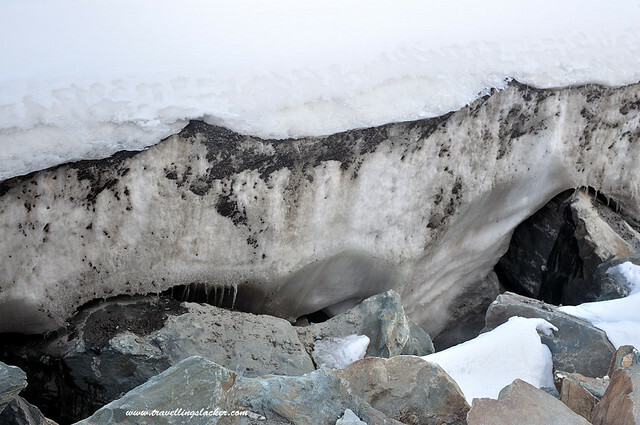 He warned us that the winter snowfall was in the offing and the road was likely to close down very soon. He also told us about a violent terrorist attack that happened near the pass a few years ago. Overall, we were not particularly pumped up at that point of time. After almost an hour, the vehicle was finally ready to move again. This time, the progress was even slower. It was a treacherous and slippery road and even the seasoned driver did not dare to drive faster than 10 kmph at any point of time. 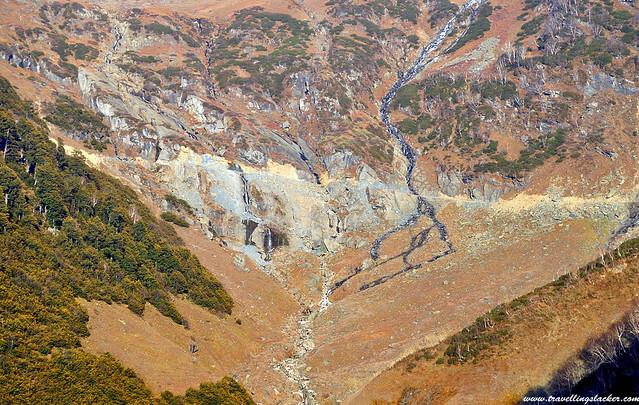 Slowly we rose above the tree line and the only vegetation remained was a thin layer of alpine grass, that too with a pale reddish hue characteristic of the autumn. The zigzag road was photogenic but it gave a tough time to the vehicle but eventually we reached the top of the pass at noon and were greeted by a temple. 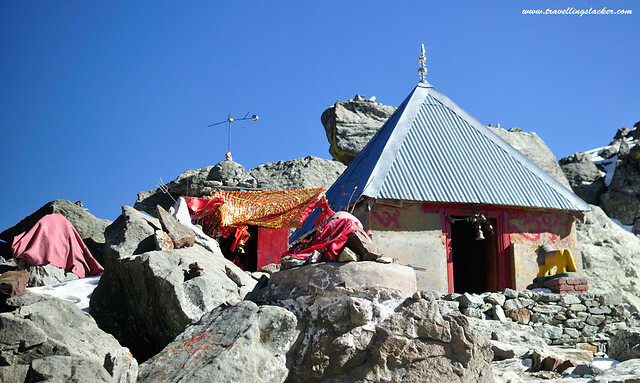 I know that temples can be found in the remotest corners in India but still, this one took even me by surprise. 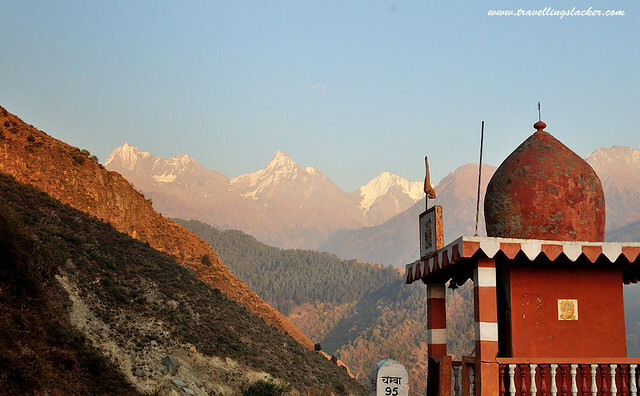 It is built so that the travellers crossing the pass can pray for a safe journey and looking at the nature of the road, I thought it is only natural to hope for divine intervention. Also it didn’t help when the driver told us a story about his friend who inexplicably disappeared along with his car in the same route, never to be found again. The pass is always covered in snow at the top. We noticed several feet thick layer of snow and it was not even winter. Officially this is a part of the “Peer Panjal” range. 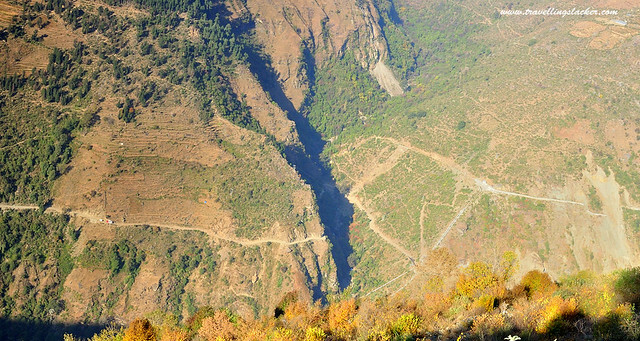 On the other side we could see the road descending down to the Pangi Valley. When we looked up, we saw clouds rising up from the mountains. It looked as if the clouds were being formed and released by the ancient mountains. Although we were freezing, we roamed around the pass for almost an hour and photographed our hearts out. The descent was a more elaborate affair. On hindsight, I think we planned it perfectly, although it was only by accident. The light was now perfect for photography and finally the benefit of paying extra for this personal vehicle became evident. We stopped the car whenever we saw anything worth clicking. 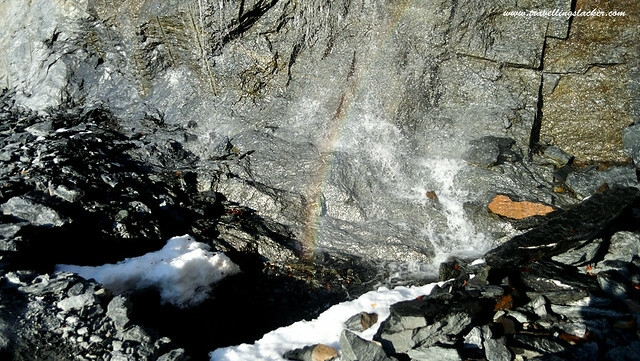 The entire route was splattered with semi frozen streams and waterfalls. 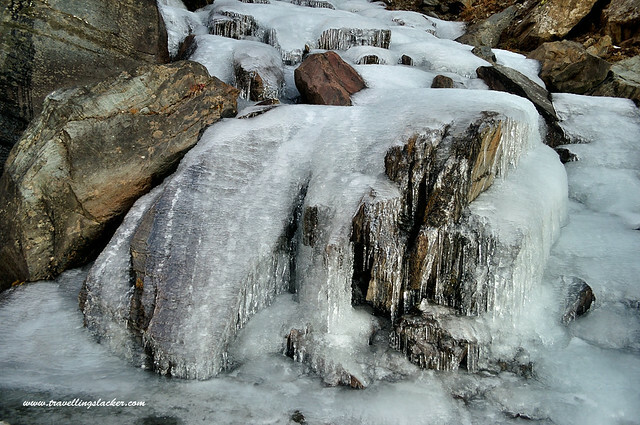 The afternoon sun had melted the snow partially and created some amazing spectacles. From sparkling glacial pools to clouds floating at point blank range, it had everything a high altitude utopia was supposed to have. It was almost dark by the time we reached back Bairagarh and stopped for a round of well-deserved tea and Maggi, again at Prabhdayal’s shop. 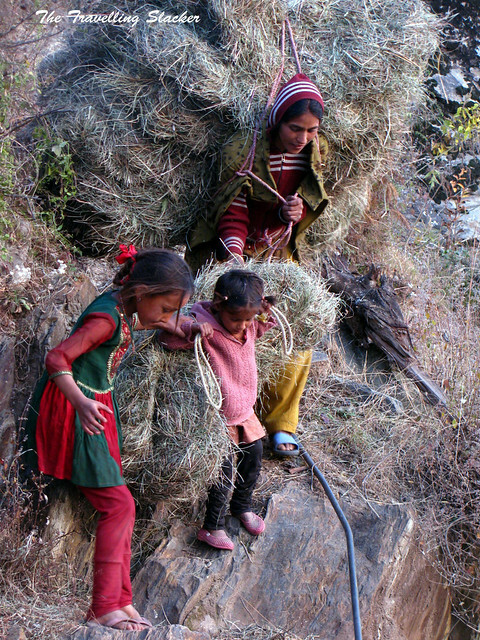 We saw a woman and two little daughters in the last leg of their daily chores. Life’s hard out there, but at least it seemed a life worth living. 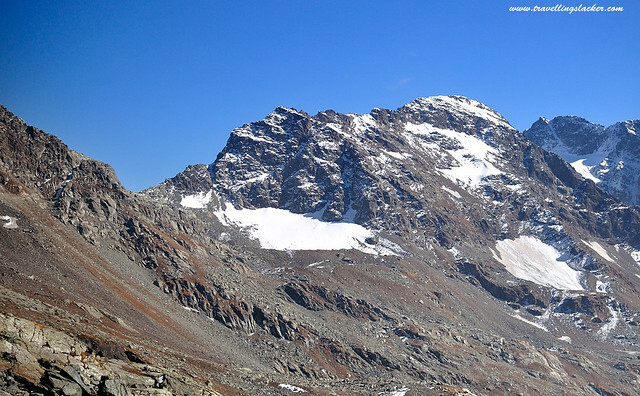 How to reach the Sach Pass? 1. Hire cabs from Chamba to Kilar in Pangi Valley. You have to ask around and find the right people but it is a small town and that should not be a problem. I have seen people travelling shared car by paying INR 600 per heard. The downside of this option is that you do not have the freedom enjoy the views and you will be at the mercy of your driver and co passengers. 2. Take a bus up to the nearest point. Then hope to meet some local guy willing to take you to the pass from there. This may not always work. It did for us. Some other nearby places such as Tarella/Trella may also attract your attention but I thought reaching Bairagarh is the best way to do it. Where on Earth is Shatrundi? 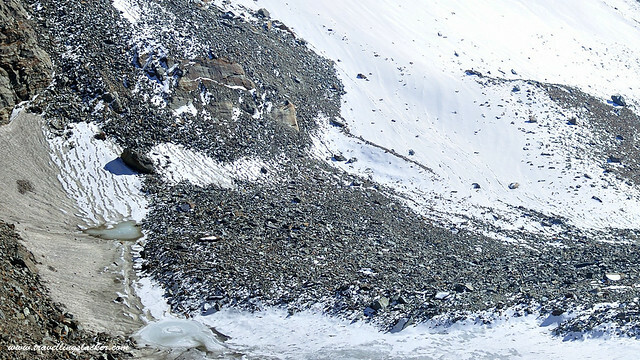 It is an advanced base near the pass. During summer buses go up to there and the check post also moves up. 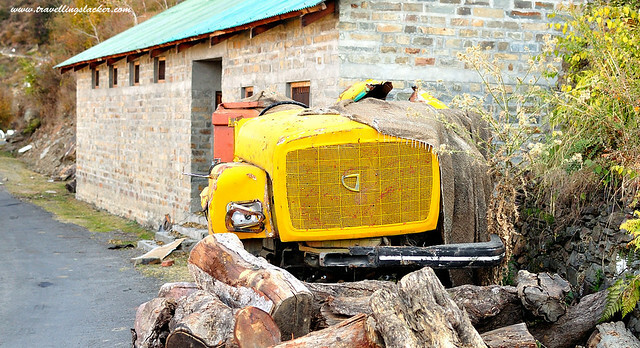 After mid October, as the temperature drops and snowfall starts, the buses limit themselves to Bairagarh and even the check post retreats to the same place. We were there in early November and there was nothing at all in Shatrundi. You need to make an entry at the check post before moving ahead. It is basic formality and no need to panic. How cold is it up there? It is freezing cold and you must take proper protection for your head, ears and hands, especially if you are from the plains and not used to such altitudes. 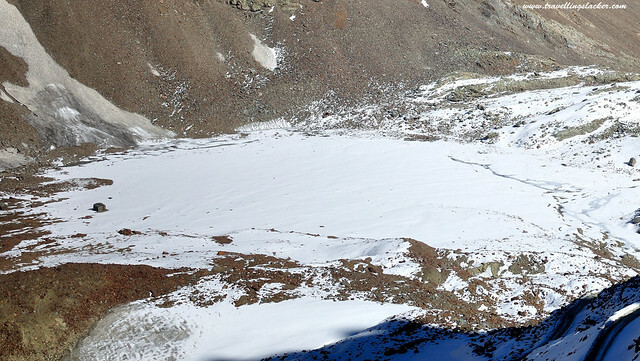 What about High Altitude Sickness? I heard a lot of paranoid rants about the same but I did not really feel anything. Take some medications if you must but do not let such thoughts cloud your trip. 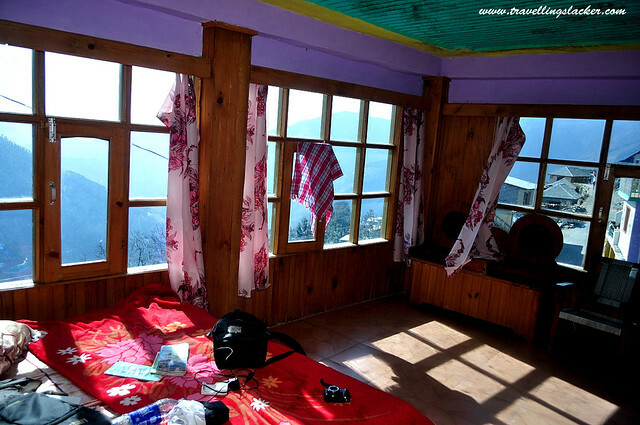 There is a government rest house but it seems you need to officially book it from Chamba itself. Nevertheless, there always Prabhdayal and his home stay. He’s the best. He will also get you the food. 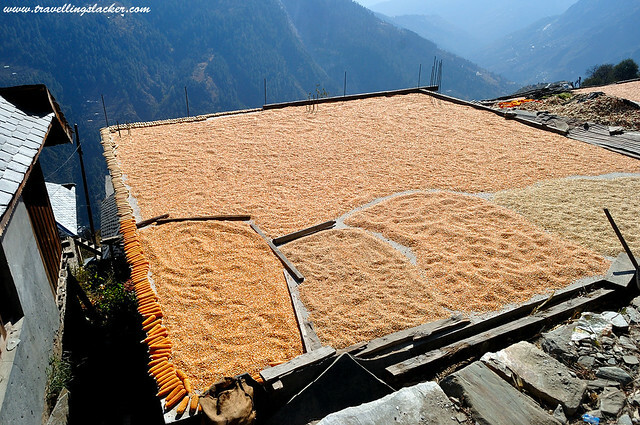 What about reaching Pangi Valley? We decided not to go further due to lack of time and also due to the impending winter snowfall which could block the roads at any moment. 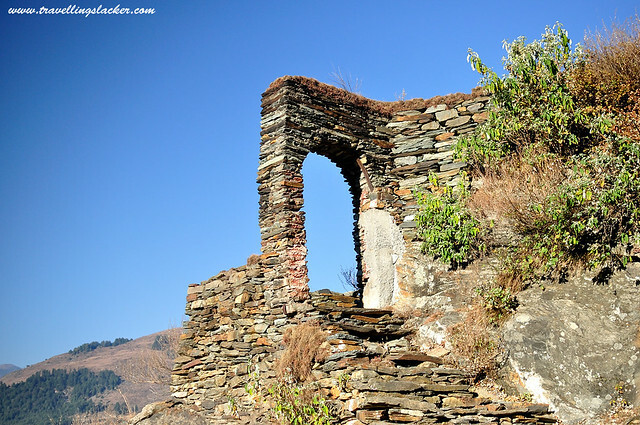 If you must go there, you should come in the summer and book vehicles from Chamba as mentioned earlier. super travelogue and excellent images! Excellete travelogue. Thanks for sharing. 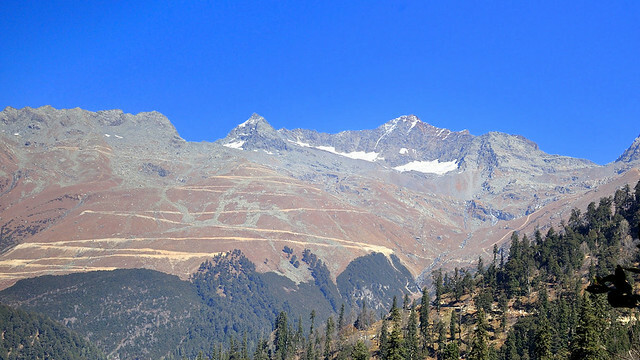 I am planning a trip to Sach pass next week. Could you please help me by providing PrabhDayal’s contact number for booking his homestay. I have a 5 year old child wid me so i want to preplan my accomodation. This is a super travelogue. 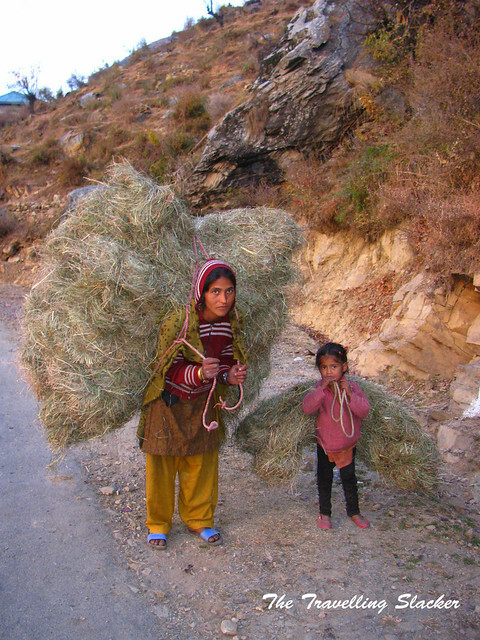 I hail from Pangi Valley and currently working with MNC at Gurgaon. 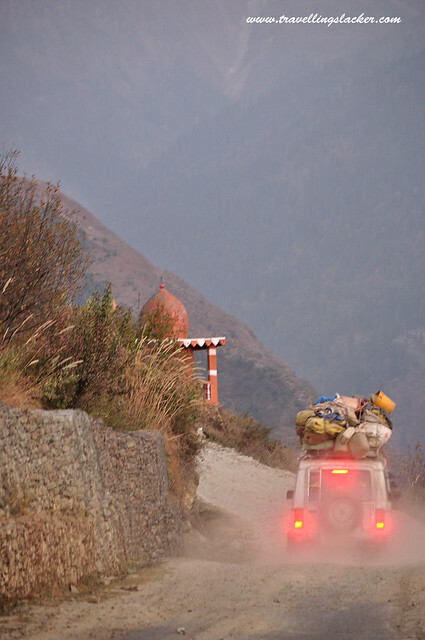 We are creating a small set up for adventure lovers in the Pangi Valley by next summer. We will love guide you further and can offer you good services in furture. 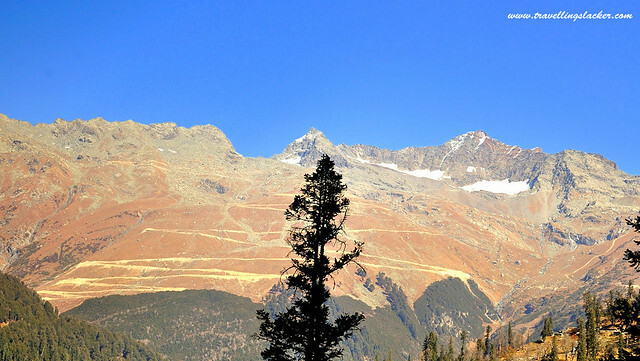 Planning to take a trip to Sach pass and onwards to Manali . I plan to travel alone and have a Duster 4×4. 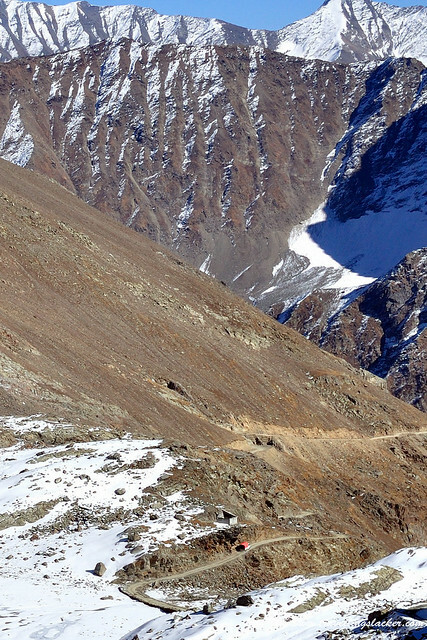 Any group planning a trip to Sach pass from Chamba side in a week’s time so that we can move in a convoy ! 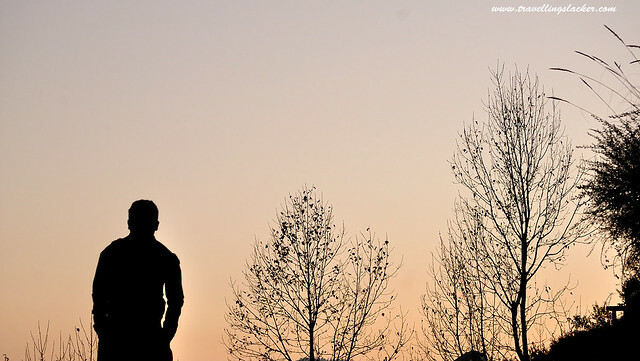 Any suggestions n guidance regarding travelling alone ? I m from a small town near Patiala ! Thanks for the blog; some useful information for me. 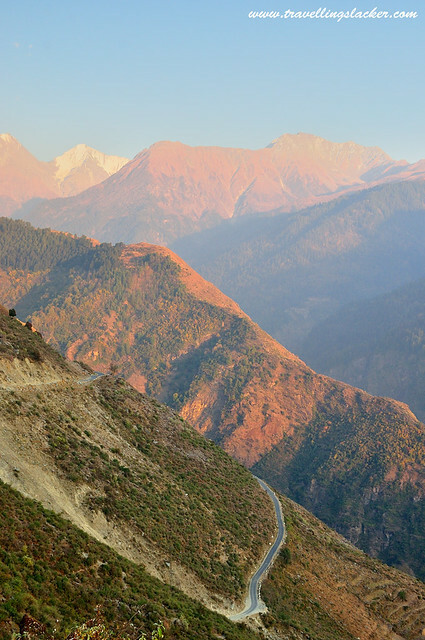 I plan to cycle Pathankot – Chamba – Sach Pass – Kilar – Kishtwar – Srinagar, start in mid-June (or as soon as the pass opens!). It’s good to know that there is accommodation at Bairagarh. Do you have contact information for the government rest house? I cycled from Tandi to Srinagar, through Pangi, in 2014. It is a beautiful area! Lucky you to have met a local who agreed to take you to the pass! I like looking at your photos. It feels like I’m physically there. Thanks for sharing such an experience! You have some nice photos here, good job! 🙂 And I have to say, that accommodation of yours – it might be the “godforsaken location” as you’ve said it, but it sure provides one great view of the surroundings, love it! I always get crazy when I read this kind of posts because I am in love with mountains, I just want to go to all of them. There looks so beautiful it is so wild, also love the local people loving there. 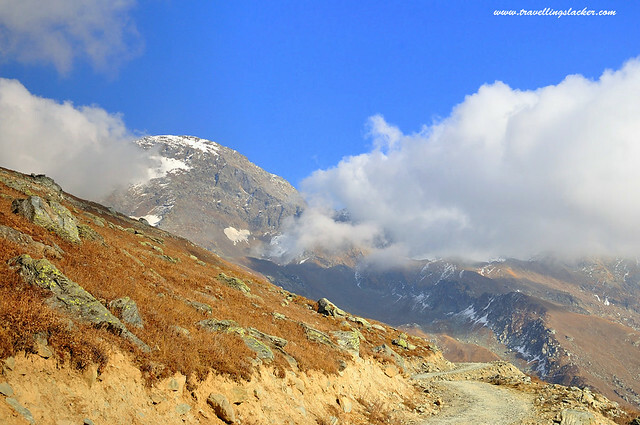 Have been longing to visit Sach Pass since a long time now but definitely all pepped up to set our plans soon now! Thanks for such a detailed itinerary . I am excited about a road trip now! Quiet an adventure! And yes, the accommodation could have been better, but you get an amazing view. Alway like meeting and talking to locals. 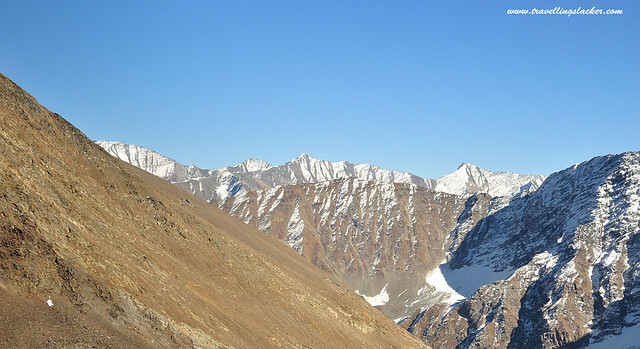 Your account of Sach Pass journey is indeed intriguing. We ourselves came across a lot of difficulties during the time which we did pray for divine intervention. Most of the time we could just hum “highway to hell” in our minds! 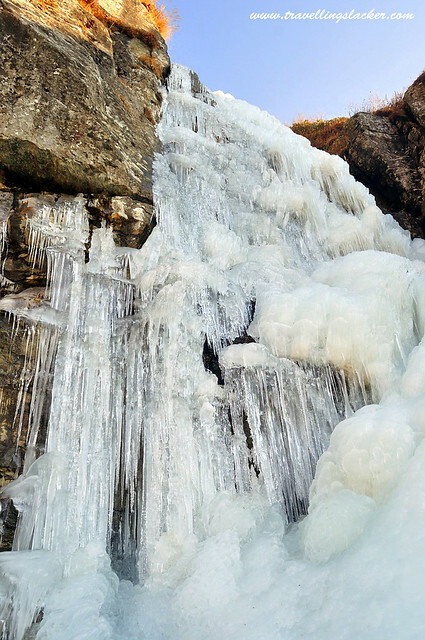 We had to like zip our way through ice and landslides and water. 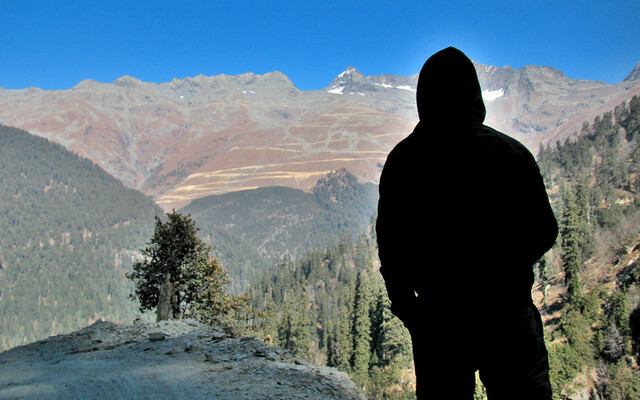 It was sure one hell of a journey to one of the most unforgiven places in the Himachal.